Upon the Boston Celtics overcoming yet another improbable win over the Miami Heat to take a 3-2 series lead in the Eastern Conference Finals, I listened to Kevin Garnett drop some serious bombs. I'm not talking the kind of bombs that make the average fan and joe-blow sit back and say 'whoa -- did he really just say that?' No, not quite. I'm talking about the kind of comments that have been true longer than we would like to admit, but it just takes a bold showing to pull away that veil of denial to expose the truth. With Garnett craning over like he was talking to a child, Dorris Burke asked him a series of questions after the game to which he gave responses -- all of which were true. Comments about playing together as a team, proving naysayers wrong, being a professional and working on craft, owners that talked too much and my personal favorite -- "I was thinking oh God, The Truth!" There was a time when this ECF series tipped-off people had a sense Miami would walk to the Finals. The Celtics may put up a fight at home and win at least one, but for the most part, the Heat had too much talent and it would be an easy series. "This series is more a formality than anything..," I saw one Heat fan tweet out. Instead, game six is scheduled to be a throw-down in Boston, the tides have totally turned and really for the first time this season, the Heat are at risk of being eliminated. 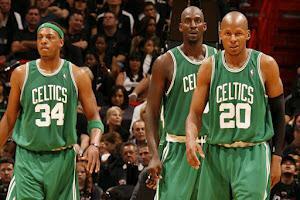 That's the reality of the Boston Celtics. One could easily make excuse after excuse about why the Celtics are only one game away from another Finals appearance -- Chris Bosh is hurt, LeBron James and Dwyane Wade are playing too many minutes, the refs have been totally against the Heat (that is laughable) and the list goes on. But there's really not any excuse that can cover what's actually happening in this series -- the Celtics are the better team. During that post-game interview with Garnett, he mentioned that when Boston is playing team basketball as opposed to one-guy taking over, that the Celtics look darn good. As much as I'd like to plead the case that the NBA is a superstar driven league, Boston has managed to find a loop-hole in the system and is winning with pure team basketball. Not to say that Rajon Rondo isn't a superstar (because we now know he is), and I am certainly not going to take anything away from Garnett, Paul Pierce or Ray Allen. But not a single one of those guys, at this point in their respective careers, is a top talent in the NBA. Rondo may be flirting with it, and with the ways he's been playing, it's hard to argue against him, but for the sake of this article, he's not the best point guard in the NBA. On the other hand, Miami is boasting James -- the best at his position -- and Wade -- a future first-ballot Hall of Famer. Beyond that, the Heat don't really have anyone (of course outside of a healthy Bosh). But in all frankness, neither do the Celtics. But there's a key difference -- unlike the Heat with Wade and James -- the Celtics' core group has trust in their role players. Although it's unlikely that Mickael Pietrus would ever take the final shot in a game over Pierce, the team still involves him in the offense and gives him looks. The same goes for the majority of bench players in Boston. Garnett went onto to talk about his craft, something he has in spades. But it's not just him, it's obvious that Pierce, Allen and Rondo all have that same dedication to improving themselves. The team clicks. It's that simple. Countless hours spent in the gym battling Father Time at the age most NBA players toss in the towel is paying dividends against a younger and coat-tail-riding-Miami-Heat-team. That extra work to develop new moves that ease the burden of being almost 10-years older than most other players on the court reflects in Boston's pursuit when down in games and the relentless effort until the final whistle. It seemed so improbable coming in, but the Celtics are close to putting down the behemoth in South Beach. One last game in Boston, where we are all well versed in how the the C's play at home, and before Miami can realize what happened -- the season is over. The reality of the Boston Celtics is that this team is doing things no one thought possible. That veil that Garnett pulled back after winning Game Five in Miami has brought clarity to the situation -- the Celtics are still championship contenders.